Here's a crucial reason to make sure vitamin D plays a starring role in pregnancy. Research published in the Journal of Neurology, Neurosurgery and Psychiatry reveals that getting enough vitamin D may cut the risk of the unborn child developing multiple sclerosis (MS). Researchers looked at data on about 152,000 people with MS. Then, they compared it with expected birth rates for the disease. What they discovered speaks volumes about the benefits of vitamin D.
From October to March, less of the ultraviolet light that lets our bodies make vitamin D reaches the skin. Researchers connected this with a significantly greater risk for MS among people born in April and May. On the other hand, the risk for MS was lowest among people born in October and November...right after their mothers had spent a summer soaking up the sun. 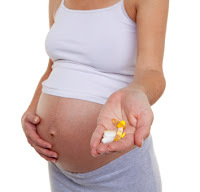 The researchers concluded that vitamin D supplementation while pregnant is very important for preventing MS. The second piece of news is about another powerhouse vitamin: vitamin C.
Researchers at the University of Copenhagen found that not getting enough vitamin C during pregnancy can put the unborn child's brain in serious danger. Even "marginal" vitamin C deficiency affects the memory center of the brain, stunting its development by 10 to 15 percent. This, of course, sets the child up for learning difficulties later in life. And once the damage is done, it can't be corrected after birth by giving the child extra vitamin C.
Let expectant moms know that the best way to find out if they're getting enough of these vitamins is to work with a doctor skilled in natural medicine to find their optimal levels, which may be different while they're carrying that precious cargo. Here are some excellent sources for vitamins.